The polar opposite of the isolated all-inclusive resort decorated in candy colors and lacking history or a sense of place, The Bowery Hotel was erected on the notorious Bowery in downtown New York City. It opened in 2007. 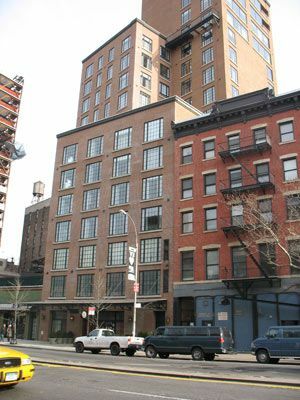 The hotel's brick exterior blends in with the neighborhood, and its 17-story set-back architecture keeps it from overwhelming tenement neighbors while acknowledging towering new ones. For more than a century, the Bowery was synonymous with Skid Row, the last refuge for the drunk, the broke, and the despondent. Then, 30-some years ago, the Bowery's streets of misery were interrupted by the arrival of CBGB, an underground rock club at 315 Bowery. Its pioneering stage featured The Ramones, Patti Smith, Blondie, and others who made their bones in the punk rock era. Hilly Kristal, the club's owner, wrote on the official CBGB Web site, "The Bowery was a... drab ugly and unsavory place. But it was good enough for rock and rollers. The people who frequented CBGB didn't seem to mind staggering drunks and stepping over a few bodies." CBGB closed in 2006, partially a victim of increasing rents in the gentrifying neighborhood. Still, no one would mistake the Bowery for Park Avenue. Century-old tenements stand near giant cranes preparing other parts of the street for new residential towers that will hold million-dollar apartments. And the architecturally distinctive New Museum, opened in 2007 at 235 Bowery, has added to the street's appeal. As the first new boutique hotel to open in the area, The Bowery Hotel is a good place to experience this legendary neighborhood in transition. The Bowery Hotel is located across the street from the Salvation Army (note the organization's iconic red badge in center of photo). Arrivals to The Bowery Hotel are greeted by a liveried doorman and whisked into a recreated world of bygone elegance. The moment you enter The Bowery Hotel, you step into a place that evokes Old New York. Its dark wood and old-fashioned lighting are reminiscent of the New York of architect Stanford White... the New York of the beautiful and notorious Gibson Girl Evelyn Nesbit... the New York of Gilded Age gourmand Diamond Jim Brady. So don't expect to receive a plastic key card to your room at faux-historic Bowery Hotel. Actual keys are secured by old-fashioned tassels and stored behind the front desk. Its walls sheathed in dark wood and its floor lined in mosaics, the dark and narrow hallway at The Bowery Hotel leads from the front desk to the room elevators to the bar, lobby, and restaurant beyond. Upstairs, guest rooms are as light-filled as the hallway is dark, thanks to floor-to-ceiling windows. Some rooms have a patio. While rooms are spacious, storage space is limited. Platform beds are sheathed in high thread count sheets. Technophiles have access to the room's stereo iPod player, flatscreen TV, DVD and CD players (DVDs available at the front desk), and can use the hotel's wi-fi at no charge. Large marble bathrooms stock C.O. Bigelow products from the oldest apothecary in America. Rooms have a minibar and 24-hour room service is available. And complimentary copies of Time Out and the National Magazine Award-winning New York Magazine inform guests of what's going on in the city the week they visit. The zinc-topped bar at The Bowery Hotel looks like a place for serious drinkers... but the velvet-topped bar stools convey a softer side. The bar offers a full complement of cocktails as well as top-shelf brands and single malt scotches. And those $17 cocktails keep the riff-raff out. Reserved for guests, the expansive lobby at The Bowery Hotels is adjacent to the bar and a fine place to enjoy a pricey libation. Part of the pleasure of staying in The Bowery Hotel is lounging in its comfortable, low-light lobby, which has an Old World look. Persian rugs, high-backed chairs, velvet settees, tapestries, potted palms, framed mirrors, polished woodwork, sconces and chandeliers with bulbs covered in mini lampshades, and wrought iron details give this new hotel the feel of one that's stood its ground for a century without being unnecessarily reimagined or renovated. In spring and summer, guests at The Bowery Hotel can repair to the gated back patio for drinks. Guests at The Bowery Hotel can enter Gemma Restaurant directly from the hotel or from outside. Gemma is an easy-going trattoria/brasserie open from 7 am until midnight or 1 am, depending on the day. The crowd it draws ranges from the neighborhood stroller set who appear for brunch on weekend mornings to the trendy set, who crowd in late at night. The menu is heavy on wood-fired pizzas, pasta, and antipasto nibbles such as frito misto. New York Times Review of Gemma Restaurant, September 2007. If you're interested in exploring lower Manhattan, SoHo, Little Italy, Chinatown, and other distinctive New York neighborhoods, The Bowery Hotel is well located. Those areas, as well as New York University's sprawl and popular Union Square, are all within walking distance. The M103 bus carries passengers further uptown or downtown, depending upon which side of the street they wait for it on. The neighborhood's traditional mix of winos and junkies, bums and beggars now includes hipsters, students from neighboring NYU, construction workers, modern art fans, and visitors who want to experience the gritty downtown city rather than the sanitized one uptown. And those millionaire condo owners aren't far behind. Is the Bowery Hotel romantic? Yes. Walking along the Bowery on a dark night or an early morning, you'll certainly want to hold your main squeeze that much tighter until you're safely inside this elegant shelter.